It is an amazing opportunity to attend a 50th Wedding Anniversary Party. It seems like fewer couples reach this momentous milestone. So, it makes it that much more special to celebrate the occasion properly. This is a great opportunity to create a special scrapbook reminding the amazing couple of all their great memories together. This Golden Anniversary Collection from .nayyan. is absolutely stunning and a great way to honor the event. Most people only get a chance to celebrate their 25th Wedding Anniversary once in a lifetime. So, you definitely want to remember every special moment from this momentous occasion. By the time the 50th rolls around, the memory isn’t quite what it used to be. 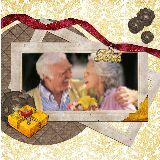 This dazzling Silver Anniversary Collection from BlueVelvet51 is ideal to capture all the great memories from this important event. 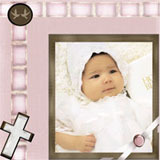 It is sometimes difficult to capture the perfect moment during a baptism or christening ceremony. If the baby isn’t crying, chances are he or she is sleeping. Once you get the perfect photo, you can document the event with this beautiful and delicate A New Day Collection from Lizandherbabes.